If you live for details, enjoy working methodically to solve problems, and have a knack for understanding software user behaviors, a job as a software quality assurance (QA) engineer may be just the tech career path for you to explore. Software QA engineers typically work in an office or lab setting. Most work 40 or more hours per week, and their schedule may be larger determined by deadlines for product release. This means that sometimes, work will exceed 40 hours per week and may include nights and weekends as well. While qualifications for software QA engineers differ according to company, job level, and location, there are some commonalities that usually apply to software QA engineer jobs across the board. These common factors can be divided into three categories: educational requirements, technical skill sets, and personality traits. There are some self-taught software QA engineers employed today, but they are in the minority. Most companies are looking to hire engineers with at least a bachelor’s degree in computer science, information systems technology, or software engineering. Professional certification, known as CSQE, is also available through the American Society of Quality (ASQ). This certification will open up opportunities for higher paying jobs and better positions for software QA engineers who take the time to obtain it. 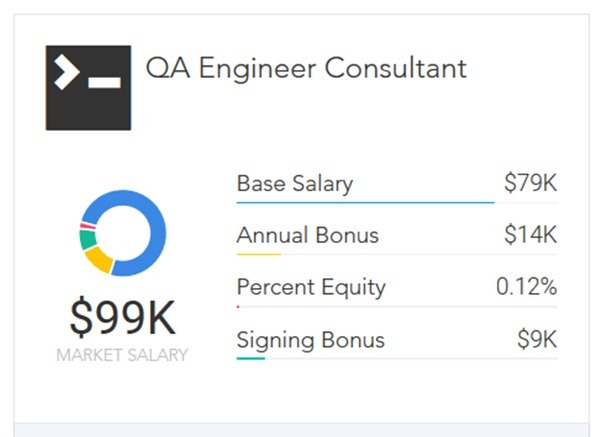 Salary: Based on 136 profiles, the average base salary for QA Engineer Consultants is $79,230 per year. The average market salary is $98.5K per year, which includes $79.2K base salary, $13.8K annual bonus, $9.05K signing bonus and $26.4K annual equity. Education: 51 percent of QA engineer consultants need a bachelor’s degree and 17 percent need a master’s degree. Skills: Skills needed include: Quality Assurance (62 percent), Testing (61 percent), Agile Methodologies (55 percent), Test Planning (44 percent), and SDLC (39 percent). Salary: Based on 14,730 profiles, the average base salary for QA Engineers is $83,400 per year. The average market salary is $103K per year, which includes $83.4K base salary, $14.6K annual bonus, $10.4K signing bonus and $25.8K annual equity. Education: 54 percent of QA engineers need a bachelor’s degree, 14 percent need a master’s degree, and 1 percent needs a doctorate. Skills: Skills needed include: Quality Assurance (55 percent), SQL (42 percent), Agile Methodologies (41 percent), Testing (40 percent), Test Automation (34 percent), and Test Planning (30 percent). Salary: Based on 122 profiles, the average base salary for QA Engineer Contractors is $88,656 per year. The average market salary is $109K per year, which includes $88.7K base salary, $14.3K annual bonus, $8.97K signing bonus and $20.7K annual equity. Education: 52 percent of QA engineer contractors need a bachelor’s degree and 9 percent need a master’s degree. Skills: Skills needed include: Quality Assurance (74 percent), Testing (66 percent), Software Quality Assurance (48 percent), Test Planning (45 percent), Test Automation (44 percent), and Agile Methodologies (42 percent). Salary: Based on 5,622 profiles, the average base salary for Senior QA Engineers is $97,749 per year. The average market salary is $117K per year, which includes $97.7K base salary, $14.7K annual bonus, $6.83K signing bonus and $25.7K annual equity. Education: 42 percent of senior QA engineers need a bachelor’s degree, 22 percent need a master’s degree, and 1 percent needs a doctorate. Skills: Skilled needed include: Testing (64 percent), Agile Methodologies (62 percent), Quality Assurance (47 percent), Test Planning (36 percent), and SQL (36 percent). Salary: Based on 291 salaries, the average base salary for Senior QA Engineer Leads is $103,553 per year. The average market salary is $123K per year, which includes $104K base salary, $14.8K annual bonus, $7.41K signing bonus and $34.1K annual equity. Education: 46 percent of senior QA engineers need a bachelor’s degree, 15 percent need a master’s degree, and 1 percent needs a doctorate. Skills: Skills needed include: Agile Methodologies (58 percent), Quality Assurance (55 percent), Testing (55 percent), Test Automation (55 percent), Test Planning (55 percent), and SDLC (45 percent). 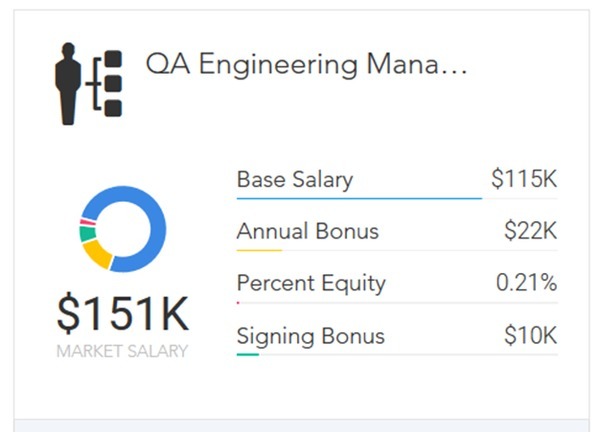 Salary: Based on 459 profiles, the average base salary for QA Engineering Managers is $115,358 per year. The average market salary is $151K per year, which includes $115K base salary, $21.8K annual bonus, $10.4K signing bonus and $35.2K annual equity. Education: 50 percent of QA Engineering Managers need a bachelor’s degree, 21 percent need a master’s degree, and 2 percent need a doctorate. Skills: Skills needed include: Quality Assurance (57 percent), Testing (52 percent), Agile Methodologies (48 percent), Test Automation (29 percent), Software Development (26 percent), and Scrum (25 percent). The U.S. Bureau of Labor Statistics predicts that this field will see 17 percent growth between now and 2024, so software QA engineer job prospects are generally good. An additional benefit of becoming a QA engineer is that it provides you with a number of different career paths to pursue, including computer systems analysis or information systems technology. Seasoned QA engineers also often end up in management positions, as they are tasked, in part, with bridging the gap between developers and the C-suite. If you are thinking of pursuing a career as a software QA engineer, the Paysa platform is an invaluable resource. Paysa collects data concerning salary, average time to promotion, and skills prerequisites from thousands of job profiles among the top companies hiring tech talent today. Armed with all the information that Paysa provides, you can quickly see where you stand in the job market. You can assess the education you need to pursue, the technical skills you need to acquire, and the salary for which you can negotiate with confidence. Paysa provides pointers at every step of the way, helping you maximize your potential in your chosen field. To get customized recommendations regarding education, skills, and compensation that will help you find and land the job you want with the compensation you deserve, simply sign up to personalize Paysa for you today. Previous ArticleHow Far Will Your Tech Salary Go in San Francisco?